Issue number three of the Hospitals Investigator was produced by Robert Taylor in April 1992 and was largely devoted to the subject of isolation hospitals, and more particularly the model plans published by the Local Government Board from 1888 onwards. Just about all local authority isolation hospitals built after that adopted these plans. 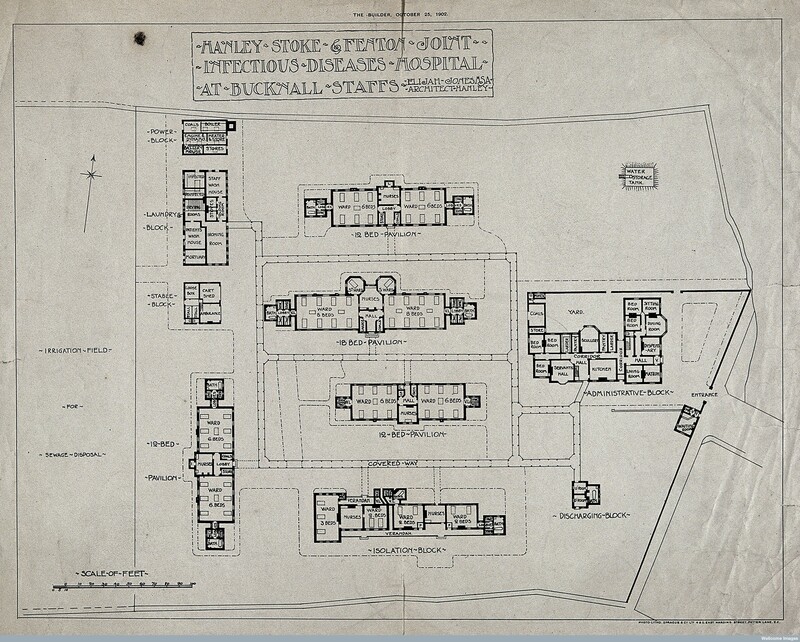 This plan from the Wellcome Images collection of Bucknall Hospital is a typical example. Colin and I visited the hospital in May 1993, when it was still functioning under the NHS specialising in care for the elderly – a not uncommon re-use of former infectious diseases hospitals. It closed in 2012, and plans for housing on the site were in the pipe line in 2014, retaining just two of the hospital buildings. The Local Government Board issued several memoranda to local authorities on the subject of arrangements for infectious diseases. The Board had the duty of persuading local authorities to make suitable provision, preferably by means o hospitals, but also gave or withheld sanction to raise loans for such purposes. This meant that plasm for proposed hospitals had to be approved by the Board if the building costs were to be raised by borrowing money The hospital plans contained in the Board’s memoranda were thereof important guides to local authorities wanting to building hospitals. Patients with different infectious diseases cannot be kept in the same ward. Villages should be able to accommodate about four patients in two separate rooms at small notice, and the memorandum, and all editions up to and including 1893 then describes the type of arrangement associated with ‘pest houses’. Tents or huts could be used to extend this basic accommodation if needed, but tents are not mentioned after 1888. Towns need more accommodation more frequently, and there is greater likelihood that more than one disease will have to be treated. Consequently the minimum provision is two pairs of rooms, the size depending on the size of the town. Permanent building should ideally provide for more than the average requirements of the town, and should have space around for the erection of tents. In an epidemic it may be necessary to extend the hospital, by means of huts or, in summer, tents. The tents may be bell tents or Army Hospital Tents, with paved approaches and boarded floors. Regulation bell tents are said to be 14 feet in diameter, and regulation hospitals marquees 29 feet by 14 feet. Huts should be raised eighteen inches above ground level, and spaced not less than three times wall height apart. they should have ventilators along the length of the ridge. There are plans of two types of hut. The first is arranged on one or both sides of a covered walkway, and consists of a hut with bathroom and kitchen next to the walkway, and a lower sanitary annexe at the outer end. these are arranged on either side of an administrative building, and resemble Emergency Medical Scheme hutted hospitals. 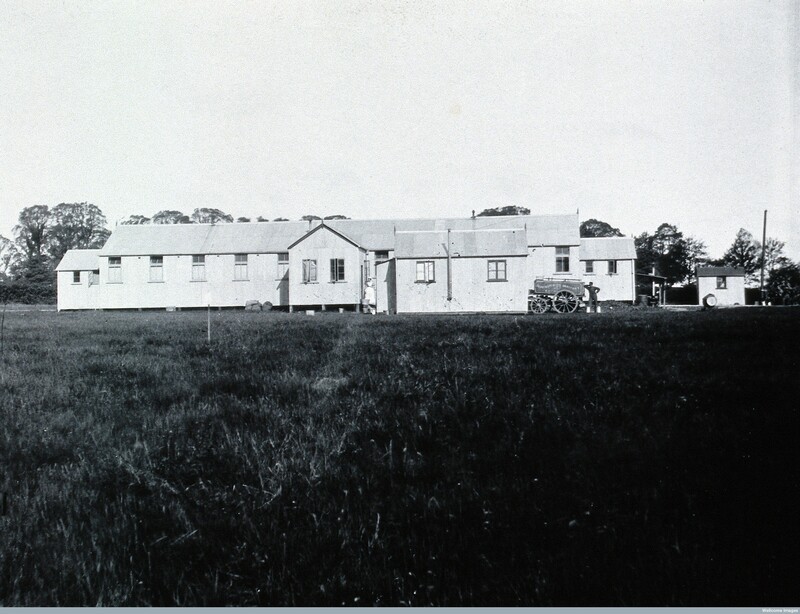 The second contains two wards and a central nurses’ room etc in one hut, and a sanitary annexe at each end, generally resembling later simple ward blocks. There is also a detached kitchen. The second memorandum, the first of several to be titled On the Provision of Isolation Accommodation by Local Sanitary Authorities, was dated March 1888. Although it is only an edited version of the earlier document, it reflects the experience gained since the Public Health Act of 1875. The principal change is in the plans of hospitals Both of the original plates are abandoned in favour of three new plates with four plans – A to D.
Plan A is a small building for four patients, with two-storeyed nurses’ accommodation flanked by two single-storey wards reached independently by a verandah. There is a detached laundry and mortuary. The same plan was also published in the 1892 memorandum, but not thereafter. 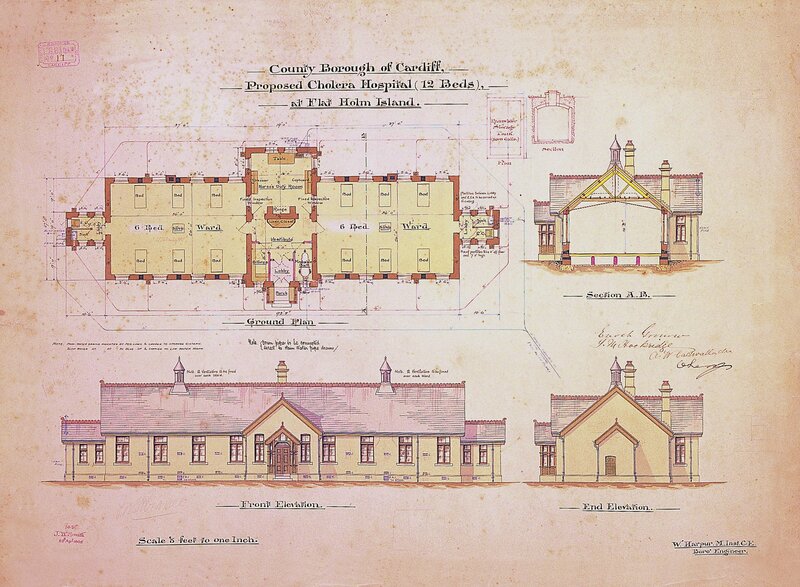 Plans B and D are of a completely new type of ward block, characterised by having the verandahs in front of the male and female wards facing opposite directions, and having the duty room recessed between two flanking wards. Plan B is a single range with all wards in line, while D has the larger end wards set at right-angles as cross-wings. Water closets and sinks are in detached blocks against the outer face of the verandahs. Plan B was included in the 1892 memorandum, but otherwise these distinctive plans were not published in the later editions. Plan C is of a rectangular block with two wards separated by an entrance lobby and a projecting duty room. At the outer ends of the wards are small projections with water closet and sink. This basic plan was repeated in all subsequent memoranda. In 1900 it is described as the most advantageous and convenient plan, and it is suggested that one ward could be larger than the other so that children could be included with women. In 1902 and 1921 the plan was repeated along with an alternative arrangement, having two projecting single-bed wards flanking the duty room. In all of these later publications, the original plan letters were retained. To the requirements of 2,000 cubic feet of air space and 144 square feet of floor space are added 12 linear feet of wall space for each bed, and also the necessity for a space of 40 feet between wards and hospital boundary. In 1892 a height of 6 feet 6 inches is given as the minimum height of the boundary fence, which should be a wall or close fence. In a note added in 1902 a hedge between barbed wire fencing is regarded as acceptable in ‘unfrequented situations’. An enlarged edition of the memorandum was published in 1900 and reprinted with minor changes in 1902, 1908 and 1921. It is emphasised that the hospital should be in readiness beforehand, and that it is for the protection of the pubic at large rather than the benefit of individuals, so that restrictive charges should not be imposed. The combination of authorities in sparsely populated districts is encouraged, provided that patients do not have to travel long distances. A proportion of one bed to each thousand inhabitants is mentioned as a rough but unreliable guide to size of hospital. Although a site plan had been published in 1892 showing the three principal buildings and the 40 foot cordon around them, they were not defined and described until 1900. They are ward block, administration block and out-offices. A new site plan is published, appearing as plan A from 1900 onwards. Wooden and iron buildings are poorly insulated and difficult to maintain, and so unsuitable; the Board does not sanction loans for them. The administration block should contain no patients, but accommodate the matron, nurses and servants, and have a single-storey kitchen. It may be an existing house, and should control the entrance to the hospital. It should also be larger than at first required. Ward blocks should be single-storey unless unavoidable, in which case each storey should have a separate entrance from the open air. Two types are described as being suitable for small hospitals; large hospitals may need other types. 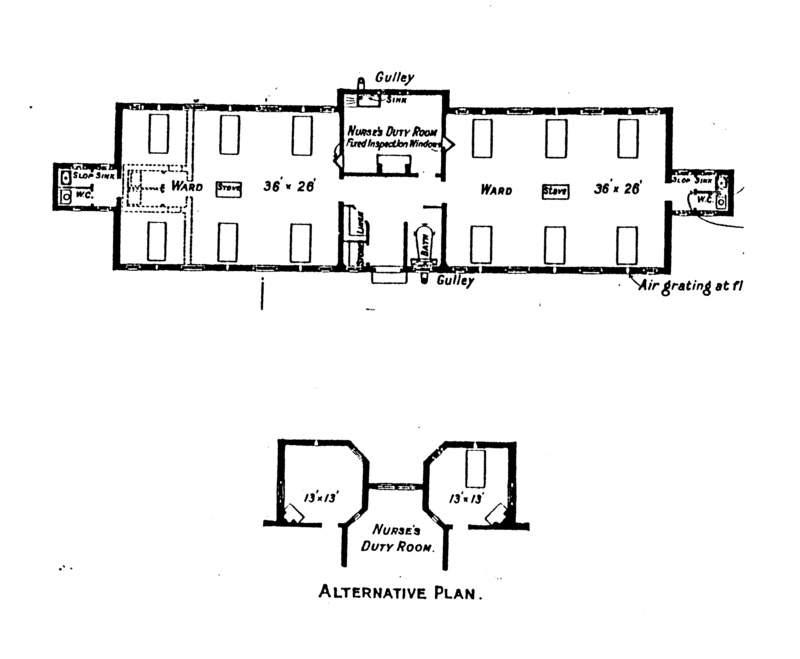 Plan C has been discussed above; a note added in 1902 says that the space in the centre over the duty room is sometimes used as a day room for convalescent patients. Plan B is a new plan that underwent several changes. It is called Isolation Block on the site plan, and is described as useful under a variety of circumstances, such as keeping complicated cases under observation, for paying patients, and for extra diseases. 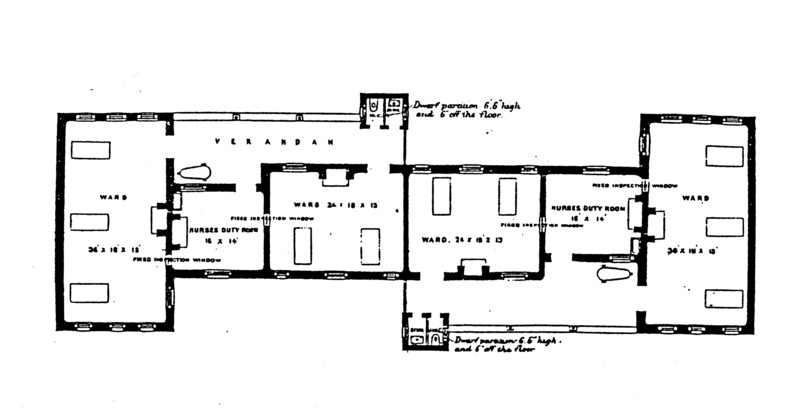 The plan of 1900 is of a rectangular block with a recessed duty room between two small wards; there is a continuous verandah across one side, with a single detached toilet block opposite the duty room. An internal lobby protects the door of each ward. In 1902 this plan is modified significantly. The duty room is made to project slightly, and the internal lobbies removed from the wards. More important, the toilet block is divided into two separate blocks, with an enclosed lobby linking them to the ward doors, and also separating the two end sections of the verandah. The sink room is only accessible from in front of the duty room. A third plan D, was added in 1908 and repeated in 1921. It is called an observation block, and is said to be for single cases of a disease, or for mixed or doubtful cases. The lower provision of 1,400 cubic feet of air is justified on the grounds of efficient ventilation and the separation of individual patients. It consists of a rectangular block with two single-bed wards on each side of a central duty room. A glazed partition separates the pairs of wards. All rooms are reached from a continuous verandah, on the outer side of which is a single block containing water closet, sink and portable bath. The space for each bed is repeated, wight he additional restriction that in calculating the 2,000 cubic feet any space above 13 feet from the floor should be ignored. One square foot of window to every 70 cubic feet of ward is regarded as suitable. The out-offices as defined as laundry, disinfecting chamber, mortuary, and ambulance shed; boiler house and engine house are only needed in large hospitals. A discharging block is said to be provided in some hospitals. This entry was posted in English Hospitals, isolation hospitals and tagged architecture, history, hospital, infectious diseases hospital, municipal hospital, pest house. Bookmark the permalink. I was 8 years old with TB and placed in Bucknall Islolation Ward in 1958. I found this article very interesting. I would like to know are there any photographs of the ward at the time I was there. Your best bet would be to contact Stoke on Trent City Archives at the Central Library. Another possibility would be through Facebook, if there is a local history group someone might have some old photos. Thank you. I am also need information on Cheethams Ward, City General Hospital Stoke on Trent in the 1950’s. I assume I would use the same archives. yes, I think that is where the City General’s records are, but they will be able to help you I am sure.